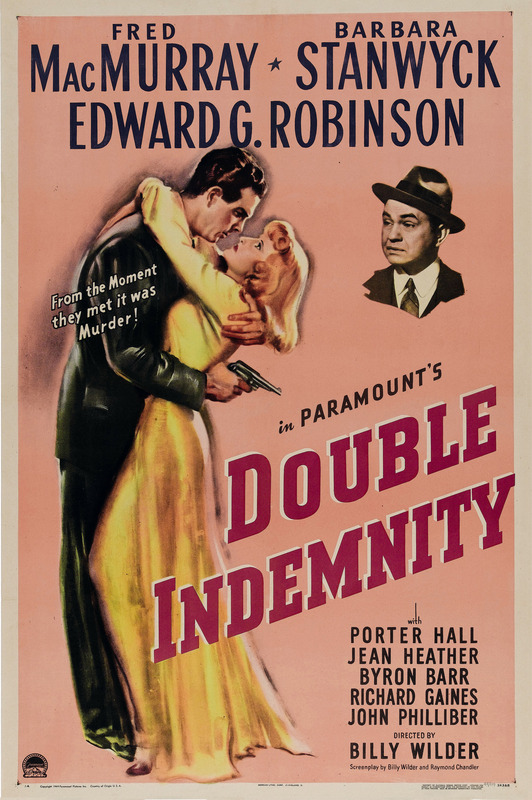 Like all the best films noir, Double Indemnity tells a twisted story of lust and greed and casual immorality, and it does so without apology or due consideration for the feelings of its audience. With its weak-willed “hero” and sleazy femme fatale working at opposite ends of the moral spectrum while at the same time being in tandem with each other, the movie playfully and deliberately explores the darker side of human aspirations, and paints a vivid portrait of what happens when someone reaches too far for something they shouldn’t have. Told in flashback in a similar style to the one used later by Wilder in Sunset Blvd. (1950), its story unfolds perhaps a little too slowly as it sets up the relationship between Neff and Phyllis. But as we get to know them, and what motivates them, it’s no surprise that their affair is as quick to unravel as the murderous plot they’ve committed to. When duplicity is this exciting, everything else seems so dull and trivial, and by making Phyllis glamorous in an obviously phoney way, it speaks volumes for Neff’s own state of mind and moral malleability. It’s psychodrama at its darkest and most nuanced. Both MacMurray and Stanwyck are playing against the type they were known for, but it’s Wilder’s belief in them that holds firm, and as a result, both actors give career best performances. As the balance of power shifts between them, and both characters act more and more out of self-preservation, Wilder tightens the screws on both of them, but MacMurray and Stanwyck are more than equal to the task, circling each other and just waiting for the slightest mistake to be made and taken advantage of. 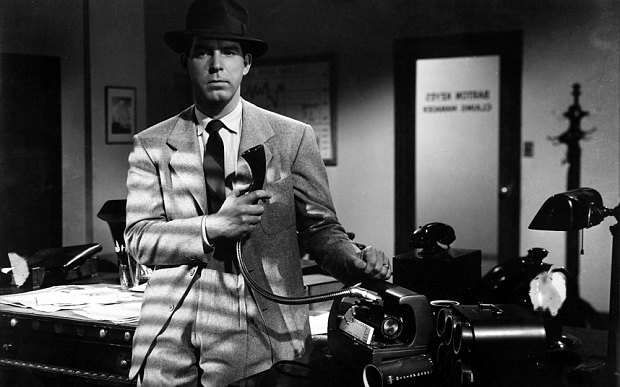 Complemented by Robinson’s turn as the investigator whose moral compass is as clearly defined as Phyllis’s is fatally corroded, the movie is a cat and mouse game with Los Angeles as a glamorous, enticing backdrop (much like Phyllis herself), and John F. Seitz’s luminous black and white cinematography, with its sharp angles and “venetian blind” lighting. Paving the way for dozens of pale imitations in the years that followed, the movie stands as a prime example of remaining true to the spirit of a story while adapting it for the big screen. James M. Cain’s novella is given a brusque workover by Raymond Chandler, but survives the encounter to provide audiences with a tough, chilly, emotionally austere thriller that is also both tawdry and exciting. 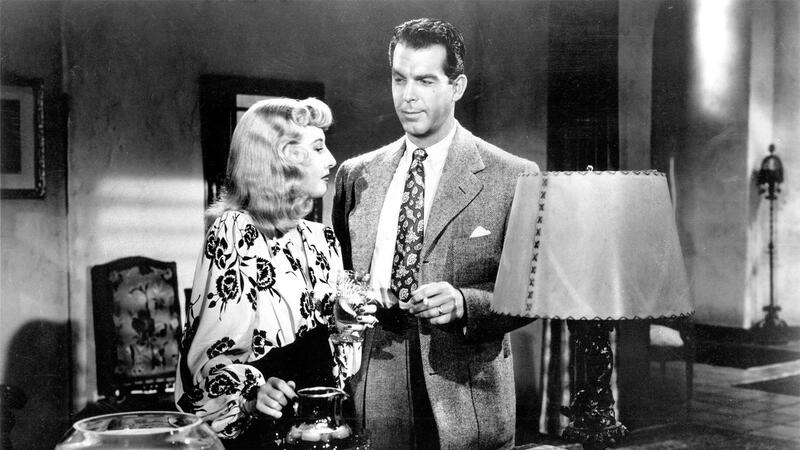 Rating: 9/10 – a movie that features a number of “firsts”, from its point of view being provided by a criminal, to the characters’ emotions being expressed through the lighting in a scene, Double Indemnity is a bona fide classic that still holds up today; increasingly tense because of its main characters’ inevitable downfall and how it plays out, and with a cruel sense of irony to spur it on, this is a terrific movie from a director, and a cast and crew, that were at the height of their powers. Cattle rustler Wes Anderson (MacMurray) is in jail waiting to be tried for his crimes but there’s an angry lynch mob planning to storm the jail and hang him from the nearest tree. When an innocent man is hanged in his place, Wes vows to seek revenge against the lynch mob (and any others). During an encounter with the head of the lynch mob and two of his men, Anderson is wounded in the shoulder. He manages to get away and heads for the town of Rio Hondo where his mother (Marsh) and younger brother Tom (Ching) still live on the outskirts. While recuperating, Wes hopes to restart his relationship with old flame Rela (Stanwyck), but while he’s been away for the last five years and hasn’t stayed in touch, she’s agreed to marry Tom in order to have a more secure future. Wes is reluctant to accept this but doesn’t try to interfere. Then one day an old friend of Wes’s, Cole Gardner (Bond) drops by with a plan to rob the local bank. 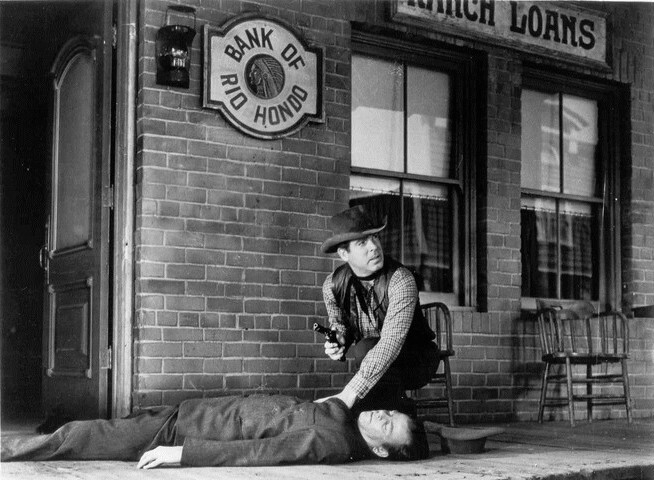 Tom, who works at the bank, convinces Gardner and an averse Wes to be a part of the robbery. What happens as a result leads to Wes and Gardner being hunted by Rela, and a shootout in the nearby hills. 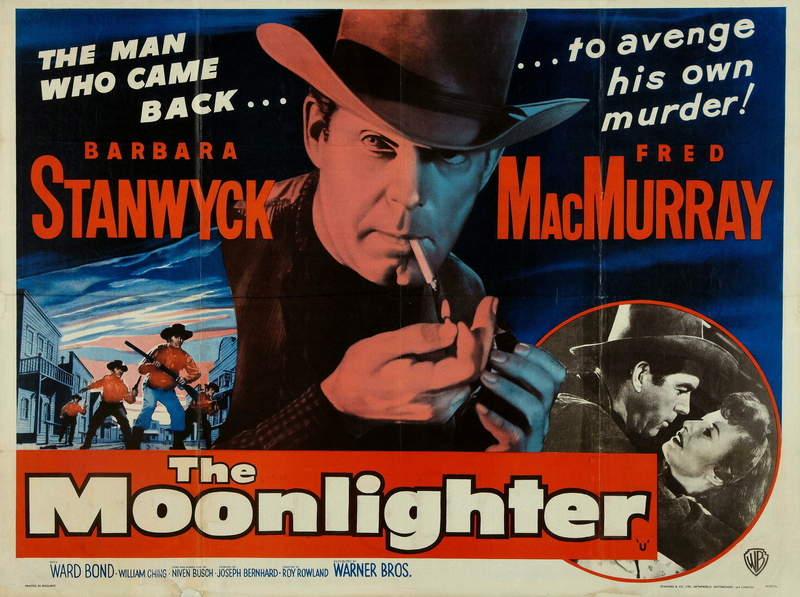 Originally released in 3D – in Natural Vision, no less – The Moonlighter is a bland, unexceptional Western that’s of note mainly for the pairing of Stanwyck and MacMurray in their third movie together. Otherwise, there’s not much to recommend, with Wes’s antipathy for lynch mobs being jettisoned once he’s injured, and Gardner’s bank job taking over as a way of moving the story forward. What twists and turns there are, are unremarkable for the most part, though the ease with which Rela is deputised to go after Wes and Gardner is probably the biggest surprise the script – by the usually more reliable Niven Busch – comes up with. It all hinges on Rela’s love for Wes, and how determined she is to bring him to justice (though the actual outcome seems arrived at because of convenience rather than any credible dramatic necessity – it’s a short movie, after all). Rowland’s uninspired, pedestrian direction makes the movie seem more of a drag than it actually is, though there’s a rough energy to the early scenes leading up to the lynching. However, this energy isn’t kept up, and with the introduction of Rela and Tom the movie begins to falter, trying to set up a romantic triangle that never really takes off or convinces. Similarly, the speed with which Wes agrees to rob the bank seems forced and implausible, but not as much as his acceptance of Tom’s being a part of it. As the reluctant lovers, Stanwyck and MacMurray inject a little of their own energy into their scenes together, but it’s not enough to keep the viewer interested in how things will turn out. Rating: 4/10 – lacklustre and plodding, The Moonlighter hasn’t the pace or the style to be anything than a standard oater with few pretensions; Stanwyck and MacMurray are as watchable as ever, but the script and direction doesn’t support them enough to help them overcome the dreariness of the material.